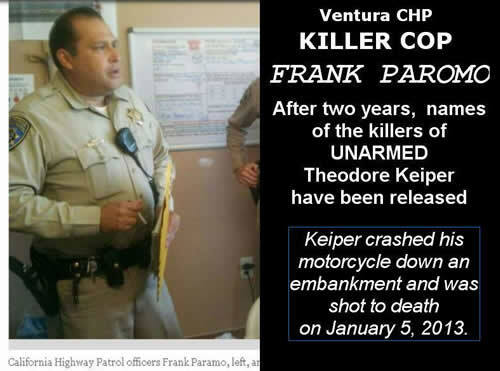 Theodore Keiper was shot to death by CHP “mystery cops” January 5, 2013. Family has been stonewalled with regards to details. No officers names released. Theodore Keiper crashed his motorcycle down an embankment and was later shot to death by CHP. Keiper was unarmed. UPDATE: KILLER COPS NAMES RELEASED AFTER OVER 2 YEARS. They are CHP Officers FRANK PAROMO and MICHAEL TRENERY. A news release from the Ventura County Sheriff’s Office, which is investigating the shooting, indicates two California Highway Patrol officers fired their guns in the incident. The news release also lists the dead man’s residence as Casitas Springs. Authorities previously said he was a Ventura resident. Theodore Kenneth Keiper, 58, died at the scene, authorities said. The incident began about 2:20 p.m. Saturday on the old southbound Pacific Coast Highway when an officer saw a motorcyclist speeding, authorities previously have said. The officer tried to stop Keiper, but he failed to yield, officials said. Authorities said the pursuit speed exceeded 100 mph. During the pursuit, Keiper turned onto Hobson Road and then Padre Juan Canyon Road, which passes over Highway 101 and up an incline into a canyon between two mountains. Keiper crashed and went down an embankment on the west side of Padre Juan Canyon Road, ending the chase, officials said. “The officers reacted to the threat by firing their handguns,” the sheriff’s office said in the news release.